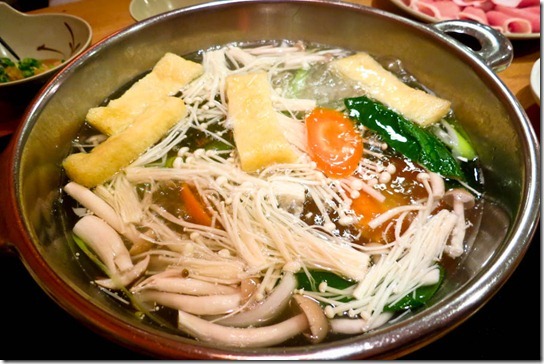 What is the difference between shabu shabu and sukiyaki? Let us eat. 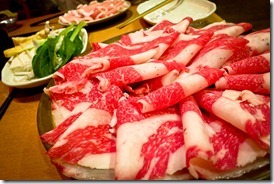 Shabu shabu and sukiyaki are two different types of Japanese cuisine where the food is prepared and cooked table side. Both are similar in style in that both used thinly sliced meat and vegetables and are usually served with a dipping sauce. However, the similarity ends there. The method of cooking yield two completely different type of cuisine, both delicious in their own way. 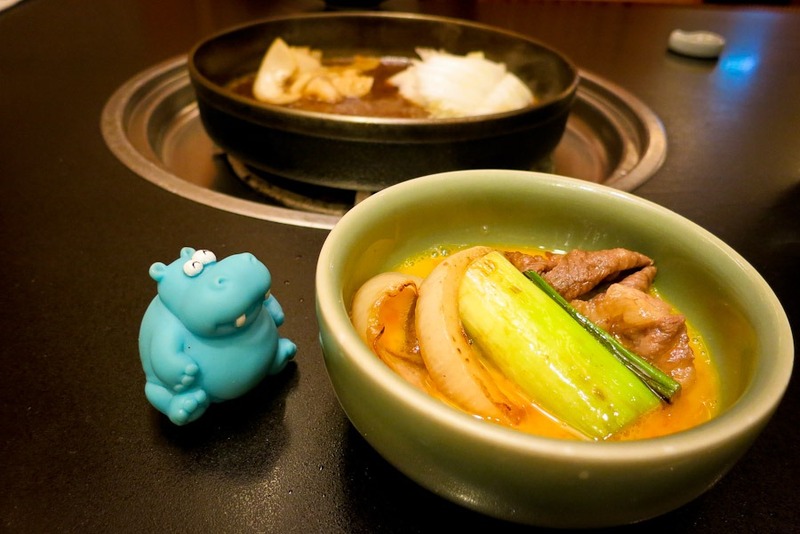 Sukiyaki is cooked skillet style and offers a rich flavor, seasoned with soy sauce and sugar, while shabu shabu is like a hot pot, cooked like soup, and tends to be more savory and less sweet. Up until now, I thought I had a favorite between the two. That all changed during our recent trip to Japan. So which is better? 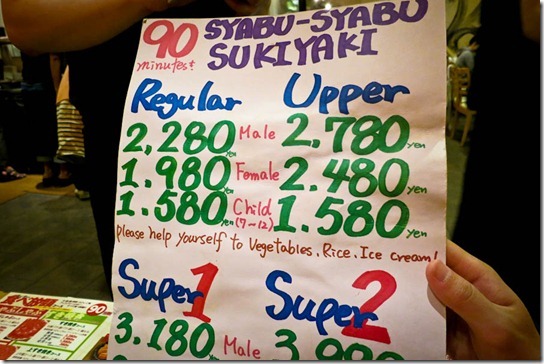 Here’s one of the many reasons why I love Japan: it’s OK to be sexist!.. when you’re having all-you-can-eat Shabu Shabu that is. For once I’m not offend. I don’t eat as much as the boys, especially not in 90 minutes, so I was happy to see I came at a “female” price. Score! Thankfully Gerard’s Uncle lives in Tokyo and had just returned from holiday the day before we had to leave otherwise we might have skipped shabu shabu at Tajiyama – it’s quite expensive. 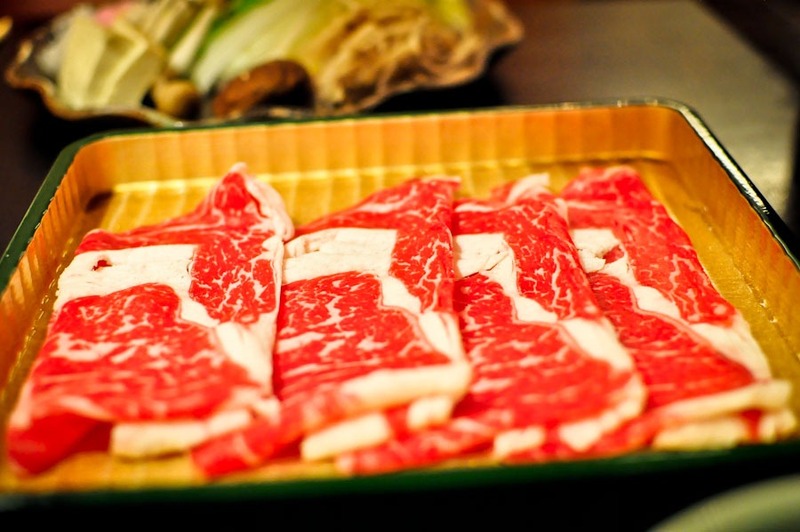 Once seated, Gerard’s Uncle pushed for the higher quality (aka more expensive) domestic beef! Who are we to argue with that? While we waited for the meat, Gerard and his Uncle stocked up on the veggies from the buffet line. 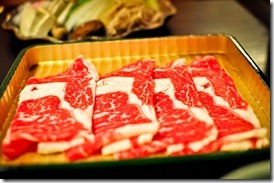 You can’t go wrong with shabu shabu because it’s all according to your taste. 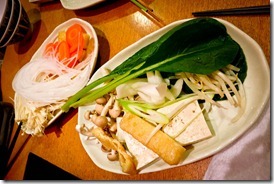 The condiments and sauces are provided and you flavor the broth to your liking. The trick is to NOT overcook the beef. We dipped the meat in the boiling broth just long enough to sear the beef before removing from the pot and quickly dunking into our dipping sauces, either ponzu soy sauce or sesame sauce or, do as I do and double dunk your meat in both! We did this nonstop for 90 minutes straight – dunking the veggies, slurping the noodles and savoring each and every prime beefy bite. 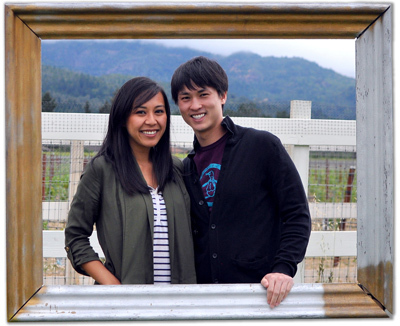 Surprisingly with all that we’d consume, neither of us felt heavy or suffered from food coma though. It was a light and very satisfying meal from beginning to end. After a long afternoon of geisha hunting in the Gion district in Kyoto, we were starved for dinner. As we wandered the neighborhood, we stumbled upon Shabu-Zen and decided a splurge meal is well deserved for successful geisha hunting afternoon. Neither of us really knew what we were getting ourselves into. We realized, we had never had a proper sukiyaki before. Ever. Our hostess/chef cooked our food table side. Thank god because we wouldn’t know what to do and probably would have overcooked everything. First she melts the lard. Then the meat and veggies goes in before she pours a hefty serving of shoyu sauce over everything. Once cooked, she strategically adds some veggies, scallions and mushrooms, along with our seared American beef into our raw egg bowl. Up until now, I had no idea what the egg was for. She gestured for us to eat, and I nervously chopstick’d my now drenched meat and took a bite. I never thought I’d say this, but.. I was in absolute raw-egg heaven! I love the sweetness of the sauce and the richness of the egg so much so I was practically slurping, it was not the best table side manners. The grilled vegetables in shoyu sauce were heavenly from the shitake mushrooms to the delicate tofu, even the onions, and you know I’m not much of an onion person. Raw eggs.. who knew? Only in Japan. So there you have it, I have reformed. 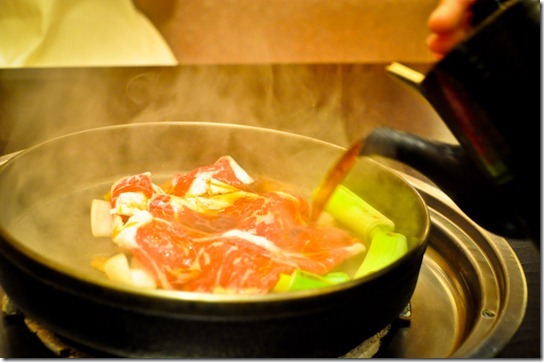 I am now, shabu shabu turned sukiyaki addict. That isn’t to say I’ll ever turn down a shabu shabu invite, because I’ve google’d sukiyaki back home and sadly, I don’t think they make it quite the same way as they do in Japan. The most important ingredient is left out – the raw egg! 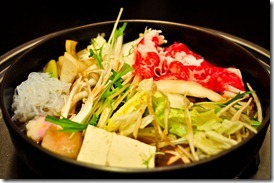 So if you’re lucky enough to come across sukiyaki done properly, let me know. Please?! Are you Team Shabu Shabu or Team Sukiyaki? O, you have to give it a try. It’ll change everything! So good.. mMm! I love it when food is prepared table-side! 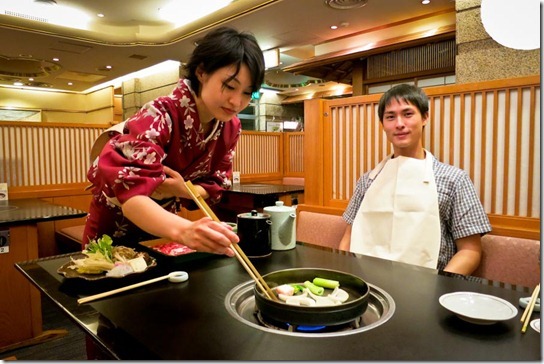 Japanese cuisine is absolutely fascinating and I hope to explore it some more. Me too. Dining and preparing food table side makes it way more fun. 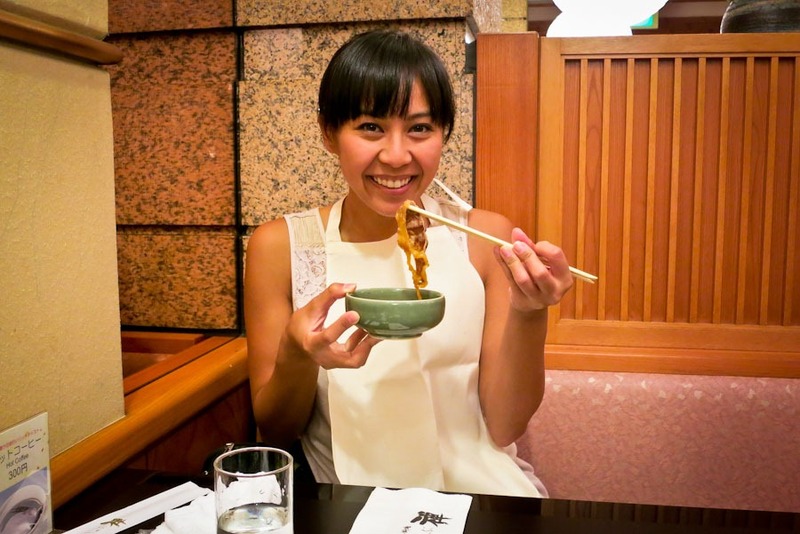 We thought we knew Japanese cuisine until we went to Japan. It really is fascinating.. and delicious. not QUITE sure how we feel about the raw egg situation, but, willing to give it a try. when in rome! or japan.. 😛 I really thought it was weird at first too and thought she was going to scramble it in the whole thing. 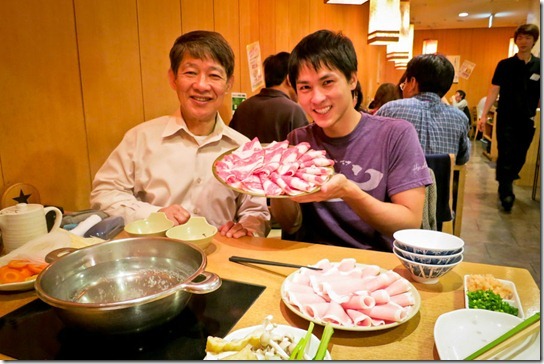 Prior to reading this, I had never heard of shabu shabu or sukiyak, but I would love to try both! I love how they cook it right at your table. Cooking your meal table side is definitely an entertaining way to eat.. you should try it! Shabu shabu sounds a lot like hot pot in China, which I LOVE (in fact, I requested it for my 20th birthday, which even my family thought was weird). 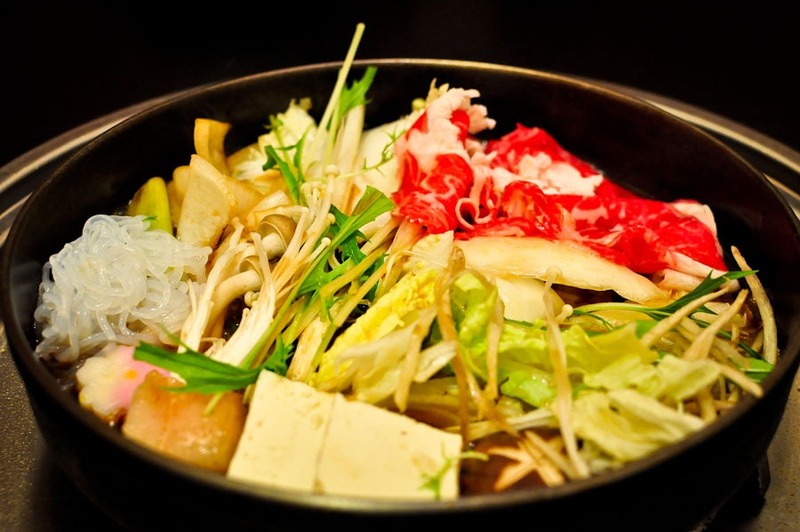 I’d love to try sukiyaki though, Japanese food has yet to disappoint me! My friends thought it was weird too. I suppose the normal birthday thing to do would’ve been to go out and have a giant banquet at a restaurant. But, well, I love hot pot more. The difference in price for men and women is kind of comical. They might lose money on me. Hahahaha.. I think your next trip should be Japan then. You’ll eat very well at a lower cost too! First off…YUM…. but the male and female pricing, that just blows my mind. Right?! I thought that was hilarious too. wow, this looks amazing guys! i would try the raw egg, no problem. And love the female/male pricing. IT makes sense!! 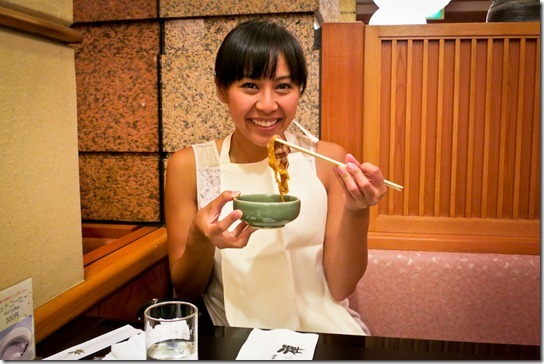 After reading this post I had to go back to the beginning to reread the difference – I clearly need to learn more about Japanese food! The raw egg sounds like it could actually be really delicious though. Also female pricing is genius, I wish we had that in the U.S.! i don’t know guys. i think you’d have to be my food tour guide to try these things. i’m a scardy cat about this kind of stuff. i DID eat a bunch of stuff this week i wouldn’t normally so…i’d try it with you! I’ve actually never tried either….can’t believe I missed both while in Japan. You know I DO love food showdowns though! I have never had either, but both look very tasty. Thanks for bringing these to my attention. When I travel to Japan again I will be sure to try these. I love a post where I read the title and recognize none of the words. Thanks for the food lesson! Haha, no problem. Hope you get to try these soon, you’ll swoon. Different prices por men and women?? Quite unexpected. 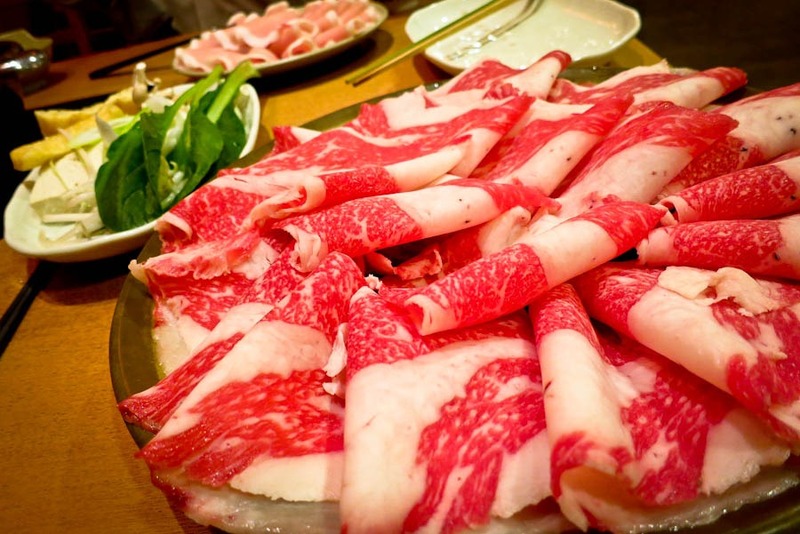 there is a japanese place in Atlanta that has been open since 1972 called Nakato Japanese Restaurant that has Sukiyaki and Shabu Shabu. And yes the Sukiyaki comes with a raw egg if you want it. it is delicious!